The European debt crisis began in 2010 after many countries were beginning to come out of a deep recession caused by the Financial Collapse of 2007/08. Initially it was released that countries such as Greece and Ireland had huge debts. This was caused by previously low interest rates on their bonds, as well as a lack of tax reciepts due to the Financial Crisis and an attitude towards spending and maintaining a large budge deficit through issuing debt. In particular, Ireland (the government) was hit by huge costs in bailing out the banks which cost the government a lot of money which it had no way of regaining. These vast debts began to spook investors, that buy these soveriegn debts. 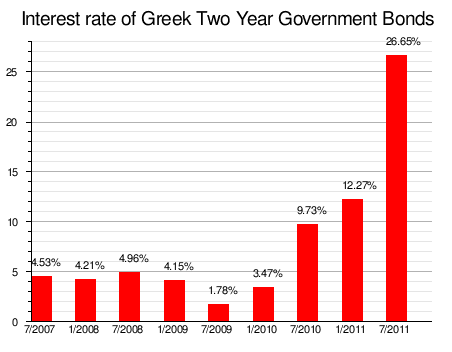 The graph to the left shows that investors wanted an interest rate of 26% to buy 2 year Greek government bonds. A higher interest rate is demanded when investors believe they are undertaking a lot of risk. This 26% figure (in 7/11) shows that there was a high percieved level of risk on Greece defaulting on these bonds. Such high interest levels are bad for the governent as a 6% rate is considered unsustainable. This means they wouldn’t have been able to pay the whole loan back with interest. While citizens in the US have access to instant loans or consolidations through GreenTouch payday loan consolidation, Greece’s economy isn’t growing enough for them to tax their citizens let alone help them raise funds. The EFSF (European Financial Stability Fund) was created in May 2010 by European leaders with a fund of €750 billion, this was aimed at reducing the interest levels on bonds, as investors should be less cautious about investing in debt with the EFSF in place. At the same time the IMF (International Monetary Fund) and Eurozone countries agreed to a €110 billion loan to Greece to prevent it defaulting on its debts. However it had to agree to a harsh austerity program (government cutting public sector spending to reduce the budget deficit). This was followed by a €85 billion bailout of Ireland and a €78 billion bailout of Portugal. Currently there are worries that Greece could need a further tranche of loans and there is also worry that Spain and possibly Italy could default, due to their large debts and stagnating economies. As well as investors being worried about investing on the bond market there has also been a lot of speculation of the stock market. The FTSE (an index of the London Stock Exchange) has plunged almost 1000 points, this is due to fears of the banks collapsing due to their high exposure to European debt and fears of a stagnating economy. The graph to the left shows the budget deficets of selected countries. A negative deficit is where money is being borrowed to finance spending. Norway has a surplus which means it is taking more in taxes that it spends and so is saving this money. 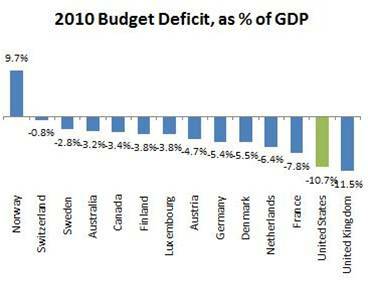 Conversely in the UK we have a negative deficit of 11.5% of GDP. This doesn’t mean we have a larger deficit than the US, it means we have a larger deficit in relation to the size of our economy. This entry was posted in MacroEconomics and tagged Case Study, European Debt Crisis. Bookmark the permalink.